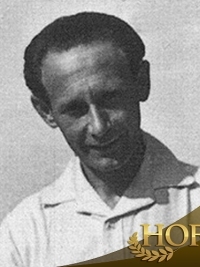 Jean Laurent Robert Borotra 13 August 1898 – 17 July 1994) was a French tennis champion. He was one of the famous "Four Musketeers" from his country who dominated tennis in the late 1920s and early 1930s. Borotra was imprisoned in Itter Castle during the latter years of World War II and subsequently fought in the Battle for Castle Itter. Borotra was born in Domaine du Pouy, Biarritz, Aquitaine, the oldest of four children. Known as "the Bounding Basque", he won four Grand Slam singles titles in the French, Australian, and All England championships. He only failed to win the U.S. Championships, as he was defeated in the final by his countryman René Lacoste in straight sets, thus missing a career Grand Slam. 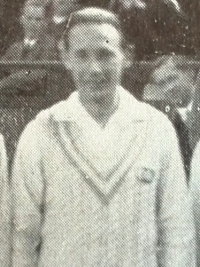 His 1924 Wimbledon victory made him the first player from outside the English-speaking world to win the tournament. His first appearance was in the French Davis Cup team of 1921. He also made the final of the World Covered Court Championships in 1922, losing to Henri Cochet, but won the doubles and mixed doubles. The other major he did well in was the World Hard Court Championships (played on clay) – he won the doubles with Henri Cochet there in 1922. Borotra was ranked as high as World No. 2 by A. Wallis Myers of The Daily Telegraph in 1926. A member of François de la Rocque's Parti social français (PSF), he became 1st General Commissioner for Education and Sports from August 1940 to April 1942 during Vichy France, leading the Révolution nationale's efforts in sports policy. Arrested by the Gestapo in November 1942, Borotra was deported to a concentration camp in Germany and then Itter Castle in North Tyrol until May 1945. He was freed from the castle after the Battle for Castle Itter, in which he played a courageous role by vaulting from the fortress and running to a nearby town to summon reinforcements. In 1974, Borotra was one of the last three people to be awarded the Olympic Diploma of Merit. The Four Musketeers were inducted simultaneously into the International Tennis Hall of Fame in Newport, Rhode Island in 1976. In 1984, Borotra received a Distinguished Service award from the United States Sports Academy in recognition of his achievements. As the oldest living gentleman's singles champion, Borotra was invited to present the singles champion his trophy at the 100th Wimbledon Championship in 1986. On 17 July 1994, Borotra, founder and president of honour of the CIFP (International Committee for Fair Play) died at the age of 95, after a short illness. He was buried at Arbonne. The International Fair Play Committee, which recognises achievements annually, awards a Jean Borotra World Fair Play Trophy. 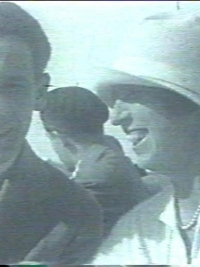 In 1938 Borotra married Mabel de Forest and they had one son. The couple divorced in 1947. In 1988 he married Janine Bourdin. His energy on the court was limitless, marked by headlong assaults and dashes for the net, both on his service and return of service, then stampede back to retrieve lobs. No player could start faster or dash so madly. His service was not a cannonball but it was not to be trifled with. His backhand return: service and backhand volley were vividly individual thrusts for the kill. Borotra was named to France's Davis Cup team in 1922, and in 1923 he assembled with Rene Lacoste Henri Cochet, and Jacques Brugnon, a great doubles player, to form the Four Musketeers. Not only did he help the French win their first Cup in 1927, but they also held it for five years thereafter. In the 1932 challenge round, Borotra reached heights of inspiration against the U.S.